I’ve been thinking about foundation a lot recently, trying to compose my thoughts on the matter. I’ve been asked by friends which foundation I recommend, I sort of go “Umm, go to a counter and ask a lady to match you”, which isn’t the advice they were after. I don’t think there is a great foundation that suits everyone. There are a lot of variables. 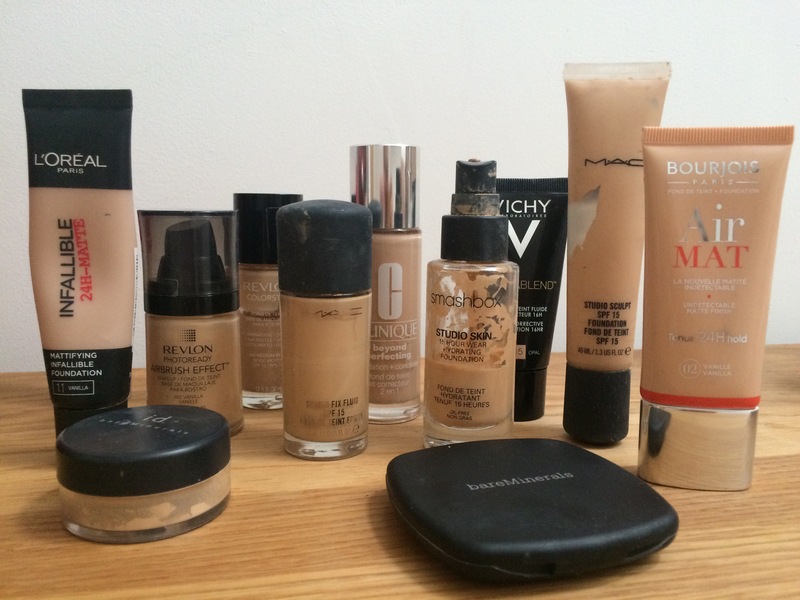 There are days when my favourite foundation, which normally works, looks horrible on me. Maybe it didn’t go with my moisturiser, maybe I applied too much or didn’t set it with powder properly. There’s a lot that can go wrong. Here’s my foundation collection. Some of it I’ve had for years. That’s probably not advisable, I may well have a problem with throwing makeup away. I’m glad I kept it though, it serves as a reminder of past mistakes. See that half full Smashbox Studioskin, I won’t be accidentally buying that again. I literally have a different opinion on foundation everyday. Is less more? Or is more, well, more? The trend these days is to layer on several different products to achieve “perfection”. I did a post about Clown contouring where you apply colour correction and contour and foundation. It looked great, really bright and flawless, but I was wearing a heap of makeup and felt self conscious. Then you have the barely there approach- keep your skin looking natural but perfected. Trouble with that is if you have actual skin problems, a tiny dab of makeup isn’t going to cover it. There is a lot to know about the subject so I think I’m going to break it down into a few posts, this being an introduction of sorts. Here is a list of the issues and considerations. So it’s not just about which foundation is “good”, if one of those 7 steps is wrong, even the worlds best foundation can look patchy or cakey. To become a foundation Jedi you must master all these steps. Clean your face– That goes without saying, I’m not going to go on about it, you’re a grown up, you know that. Exfoliate– This is a must for making your skin a smooth base, use a scrub ( I can’t stand exfoliators that contain little beads, also they’re really bad for the environment. You need a fine grain scrub to gently remove dead skin without scratching, like Kiehls Dermabrasion, it’s really good) or products containing Alpha Hydroxy acid (or fruit acids) eg. Glycolic acid and Beta Hydroxy acids eg. Salicylic acid. There are probably thousands of products contain AHAs, check out Alpha H Liquid Gold. BHAs are better for Acne or Rosacea prone skin, check out The Fab Pore by Soap and Glory. If you have very sensitive skin then a hot cloth cleanser like Liz Earle’s Hot Cloth Cleanser and a muslin could be just the ticket. Exfoliating will get rid of any flakey rough skin and allow products to really sink in. Moisturise– Definitely moisturise your eye area, for sure. I’m loving Soap and Glory’s Puffy Eye Attack for my under eye ballbags. Unless you have dry skin, stick to a light moisturiser to avoid overloading skin. An oil based moisturiser will repel water based foundation and cause it to break up. I’m using Effaclar Duo by La Roche de Posay, it’s water based and effective against spots. For dry skin try Hope in a Jar by Philosophy. Primer– Don’t get me started. I’m not sure I believe the hype. I don’t think primer makes a giant difference to how long my foundation lasts, to me anyway. I see it as more of a light base to help my foundation go on. I tried once wearing primer only on the left side of my face to see if it helped my makeup last better. 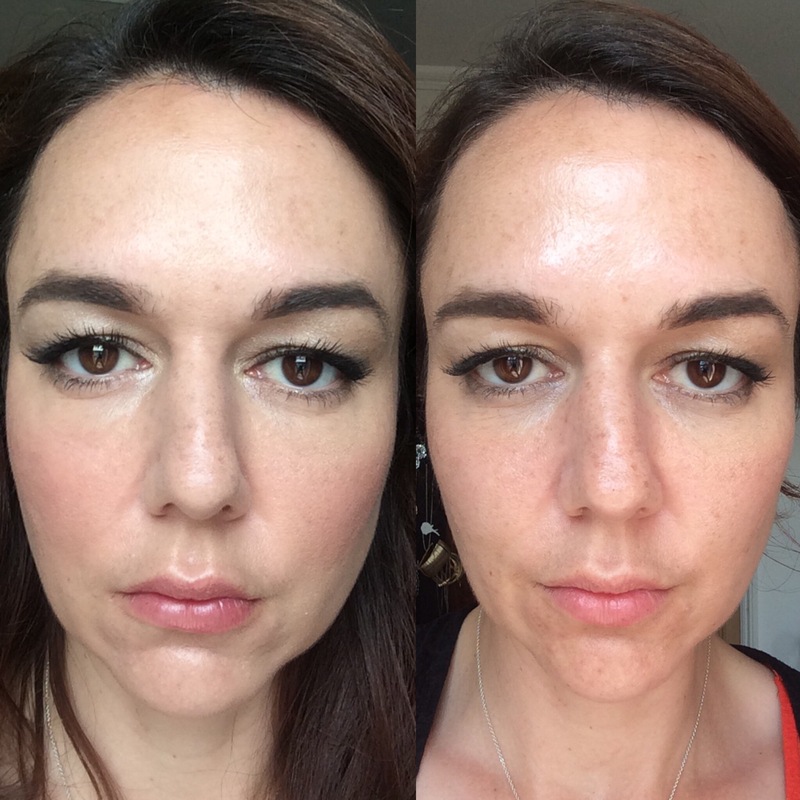 It didn’t, here’s a snap of me at the beginning and at the end of the day, I only had primer on the left side of my face. It seemed to make no difference whatsoever to the lifespan of my makeup. I keep applying it nevertheless because makeup experts recommend it. Who am I to disagree? Lovely! You have the best skin that your capable of getting, now it’s time for foundation.